One and a half month ago, Shizens launched their new Time Resistance Essence in Kuala Lumpur Golf & Country Club. To be honest that was my first encounter with Shizens skincare range and I was pretty excited to find out what is it all about as I have been hearing so much about them. Inspired and infused by bountiful natural ingredients, Shizens offers a wide range of products, from make-up, skin protection to skin care, all created to revive and nourish natural beauty. If you didn't know Shizens is a our Malaysian local brand but the skincare are formulated in Japan. And yes I love Japanese skincare so I'm really interested to see how it really flares. Before the launch officially start, we were entertained by attractive dancers... oh they are just so good! Ms. Ashley Tan , Deputy General Manager of Shizens Malaysia shared that Shizens Time Resistance Essence is a firming skincare product that helps women to realize their dreams of keeping skin firm and supple throughout the day while performing their daily tasks. Shizens Time Resistance Essence focuses on nourishing, firming, moisturizing and brightening the skin. Let's see what Jojo Goh, Shizen's Ambassador has to say about this Time Resistance Essence. And I also found out one of our friend Celeste is one of the first few to try out and she also shared her testimonial here. 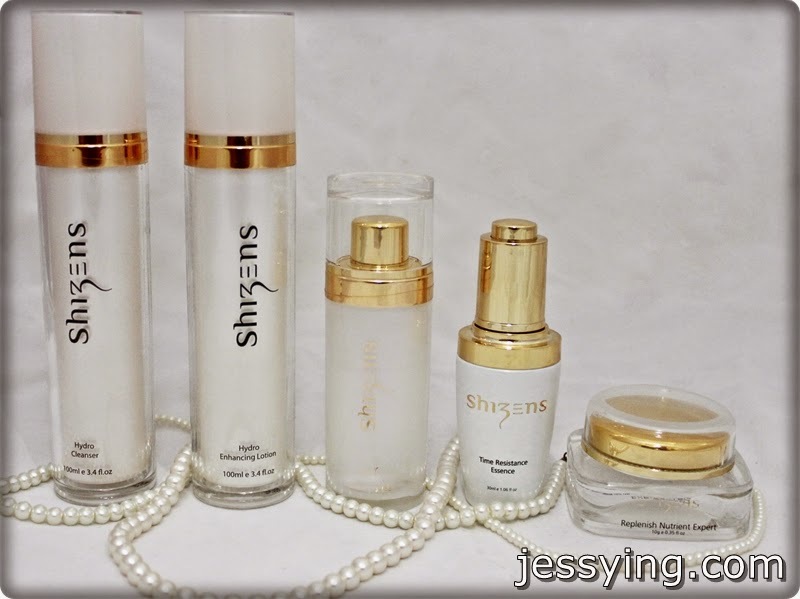 I was glad to be given a full set of Shizens products to try out and that includes the latest Shizens Time Resistance Essence. After trying out for a month (yes that is how long I used to try out skincare!) I am happy to share my views on Shizens skincare products here. Shizens Hydro Cleanser ables to remove dirt and impurities without stripping your skin moisture. It contains Aloe Barbadensis leaf extracts which is antimicrobial, antioxidant and able to moisturize dehydrated skin. Instead, it helps to increase the moisture level of horned layer to make your skin look hydrated, healthy and radiant. It is gentle, non-irritant and suitable for most skin types. Moisture level of a dehydrated skin may increase up to 70% after a continuous use for one week, on day and night time. I usually pumped out 2 times before applying a small water to form the bubble before gently massage on my entire face. After that I rinsing my face, I felt my skin is smooth and comfortable. It is great that the cleanser does not give me the drying pulling sensation after cleansing. And what I like most is the scent, very pleasant which makes me feel relaxing while cleaning up my face. As you know this is facial cleanser and not makeup remover hence if you put on heavy or waterproof makeup, it is advisable that you remove your makeup with proper makeup remover before using this facial cleanser. Hydro Enhancing Lotion serves as a second cleanser to further cleanse your face for better absorption of the following products. It contains licorice root (Glycyrrhiza Glabra) extracts to repair skin cells for deceleration of skin aging. Hydro Enhancing Lotion also contains witch hazel extracts which is antioxidant and anti-inflammatory. After washing my face, I pump out the Shizens Hydro Enhancing Lotion from the bottle. I prefer pump bottle like this for lotion as it is more convenient and it would reduce wastage too as I only pump the amount I wanted. I can either apply directly using hand or apply or facial cotton pad. Personally I would prefer to use cotton pad first to apply (as double cleansing) to make sure no residue is left on my face before I apply my other skincare. After that I would pump a little more on my hands and pat on my face gently to allow the lotion to penetrate deeper into inner layer of my skin. As the lotion texture is watery, it is very easy to absorb into my skin. I immediately felt my skin is smoother and more hydrated. Shizens Hydro Enhancing Lotion scent is very pleasant like the cleanser as both are from the Hydro range. SHUĬ in mandarin means water. This watery aqua-base product is a pure and natural way to detoxify negative substances and replenish nutrients for healthier, supple and luminous skin. Various botanical extracts are included to develop the formulation to its best, after extensive research. The essence is also enriched with the Ganoderma Lucidumextract from a type of mushroom known as ‘Reishi’ or ‘Ling Zhi’. It helps to enhance the immune system of skin and delays aging. The extract is also known as the “Medicine of Eternal Life” and is capable to inhibit the formation and deposition of melanin and irritations in skin. Other ingredients in SHUĬ include the Patchouli extract and Corallina Officinalis extract. These botanical extracts stimulate regeneration of skin cells and improve intercellular adhesion, contributing to improve skin elasticity. The high content of trace elements and mineral salts in the extracts nourish and revitalise the skin, ensuring there is sufficient moisture within. The Ginkgo Biloba Leaf extract and Kalanchoe Spathulata extract provide maximum anti-oxidant and anti-inflammatory protection. I been wanting to try this ever since they launched this last year as I have heard many good reviews about this as some has referred this as miracle water. Shizens Shui comes with a screw cap instead of a pump, I used this right after my lotion before my essence. This Shizens SHUI can be applied directly using hands or cotton pad, but since it's so precious (i.e expensive) I would prefer to use my hands to apply it using dabbing motion. After applying, I felt my skin is so much more hydrated and smoother (like baby skin!). I felt the essence absorb better after I applied SHUI and skin is smoother and plump up too when I applied SHUI before essence. Love this product, smell good and works really well... hence highly recommending this! Shizens Time Resistance Essence specifically formulated with Ceramide, a natural lipid that is essential in protecting and moisturizing the skin, Time Resistance Essence is designed to counter harmful factors and decelerate skin aging. It reinforces and supports the renewal of the skin’s natural protective layer and forms an effective barrier against moisture loss by restoring Ceramides level in skin. By plumping up the barrier, Time Resistance Essence ensures your skin retains more moisture, thus making it firmer and healthier. Time Resistance Essence nourishes skin with precisely selected ingredients such as Ceramide(plant-derived lipids), Kalanchoe Spathulata extract,Sodium Hyaluronate and others that synergize perfectly with each other to hold skin cells together and rebuild the skin barrier, while hindering the grow of harmful free radicals to decelerate skin aging. Shizens Time Resistance Essence comes in a glass bottle with dropper dispenser. I warmed up my hands with 2-3 drop of essence before I applied on my face for better absorption. Usually I took a little of my own sweet time to massage in the essence until it is fully absorb. 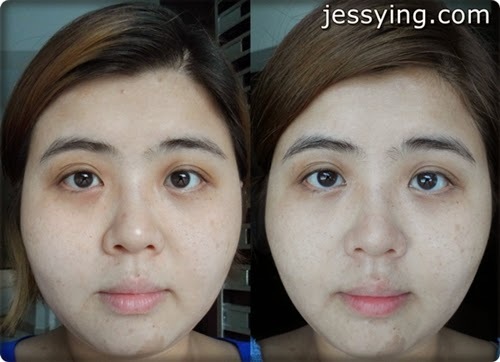 After using Shizens Time Resistance Essence for a month, I felt my skin are hydrated and can see in the picture that my face is more firm. Was really glad to see my skin texture is smoother as my pores appeared to be smaller. Overall my skin colour looked more even and brighter now. This Shizens Time Resistance Essence is suitable for anyone who are looking for an all in one anti-aging essence. It is pricey but it does delivers what it promises. Replenish Nutrient Expert is enriched with powerful humectants that attracts and hold on to water,instantly hydrates skin and keep it moist and supple. The tiny molecule of Replenish Nutrient Expert able to penetrate into deeper layers, skin tested to be 50% more hydrated after application and that subsequently reduce the appearance of fine lines and wrinkles. It also aids in balancing the ratio of moisture and oil level of our skin to achieve smooth and luminous complexion. Various botanical extracts were used in the formulation of Replenish Nutrient Expert. These botanical extracts synergize perfectly with each other to deliver the best result to our skin. Replenish Nutrient Expert stimulates the collagen production and restores elasticity of skin. Furthers the effect, it repairs the damaged collagen fibers and neutralizes free radicals caused by environmental factors. Replenish Nutrient Expert is also a potent anti- oxidant formula that acts against skin premature aging by stimulating skin cells activity as active skin cells eliminate toxins easily and optimize nutrients absorption. Valuable marine extract was chosen to develop the formulation to its best. It boosts skin regeneration and improves intercellular adhesion to restore skin elasticity at the same time helps to strengthen the skin and keep moisture where it’s most needed. It soothes, tones and prevents skin from dryness and ensures sufficient moisture within. I applied Shizens Replenish Nutrient Expert moisturizer as my final step of my skincare in upward motion to achieve firm skin texture and enhance skin’s resilience. For better result, I also warmed up my hands before applying on my face. This moisturizer is pretty light and it absorbs pretty fast leaving the my face smooth and in fact I barely feel the product is there. As I stayed in air-conditioning most of my time, my skin is very dry and this moisturiser manage to keep my face hydrated all day long. And at night time, I am more generous with the amount that I applied on my skin because I sleep in air-condition room. Don't forget to apply on your neck! Even when I was in Bangkok earlier last month where the weather was so warm , this moisturiser managed to keep my skin calm and hydrated. Remembered to apply sunblock on top of this during day time to protect our skin from harmful UV rays. As you can see I am pretty happy with all the Shizens products sent to me, let me show you my before & after picture to further show you the evidence how well it works on my skin! Surprisingly my skin tone is more even and brighter now even though I just came back from my holiday from Bangkok and Boracay Beach. I was under the scorching sun all day long and I thought my skin going to be flaky but no in fact my skin was behaving really well! This showed that my skin has locked down the moisture hence it is properly hydrated! p/s: My face didn't get darker because I was slapping sunblock every few hours! 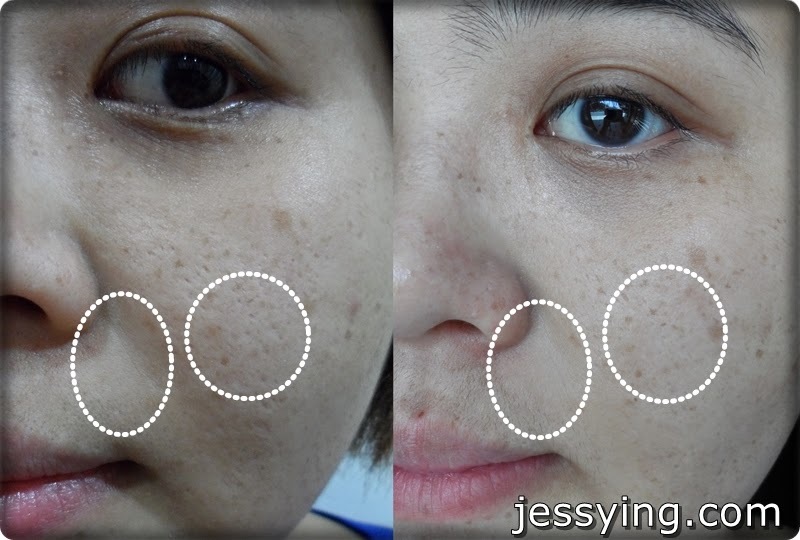 You can see my pores appeared smaller and my laughing lines appeared visibly reduced because my skin is more firm up after using the Shizens Time Resistance Essence for a month. Amazing right! After reading my reviews, now do you want to try out this Shizens Time Resistance Essence? Good news to all of you... Shizens is now giving out 7 days trial where shoppers can pick either one method to redeem the sample. 2nd method : Fill in your data at www.shizens.com and print out the email to redeem Time Resistance Essence 7 days trial at your preferred Shizens outlet. 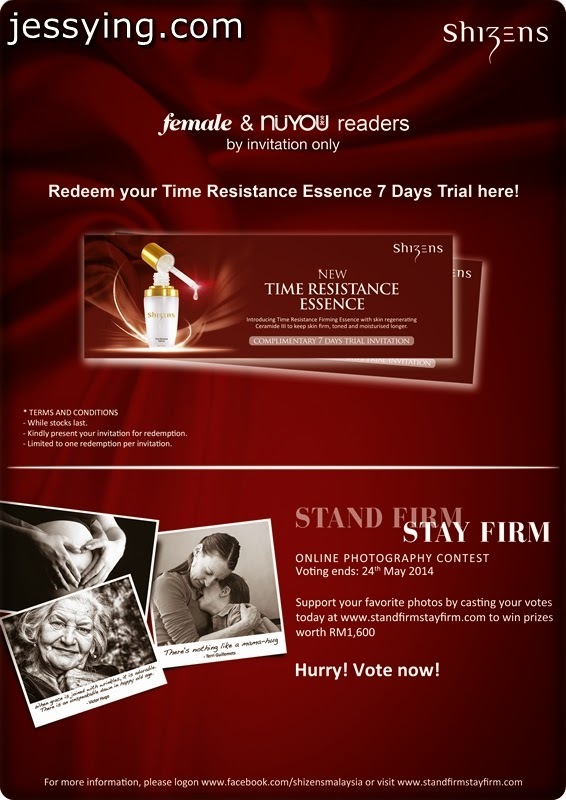 So don't forget to redeem the sample to try out the latest Shizens Time Resistence Essence! Also the Shizens Stand Firm and Stay Firm contest is now open for voting, and lucky voters stand a chance to win prizes worth RM1600!